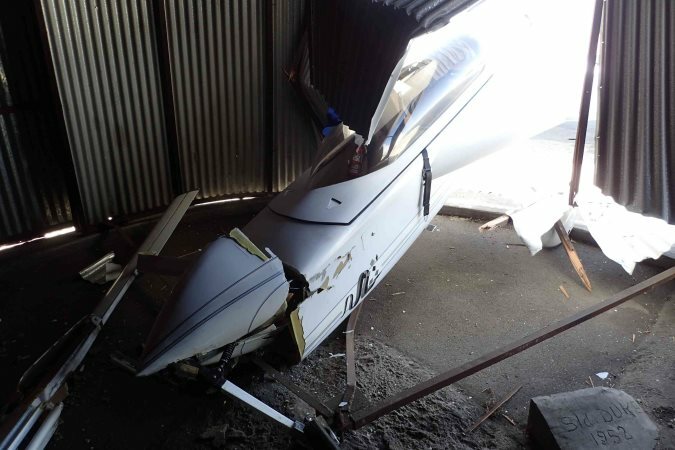 On February 11, 2018, at 1258 Pacific standard time, an experimental amateur-built Roger V Shanks (Rutan Aircraft Factory) VariEze airplane, N944X, struck a hangar during its landing rollout at Santa Monica Municipal Airport, Santa Monica, California. The private pilot and pilot-rated passenger were not injured. The airplane sustained substantial damage to the nose and canard assembly which detached from the airframe. The airplane was registered to and operated by the pilot under the provisions of Title 14 Code of Federal Regulations Part 91 as a personal flight. Visual meteorological conditions prevailed, and no flight plan had been filed. The flight departed Brackett Field Airport, La Verne, California, about 1240. The pilot reported that the landing approach to runway 21 was uneventful, and that he landed about 100 ft beyond the runway numbers. As soon as the nosewheel touched down, the pilot applied brake pressure and the airplane began to swerve to the left. He released and reapplied brake pressure, but the airplane continued to veer left. He then proceeded to alternately cycle the brakes and right rudder as the ground roll progressed. The oscillations continued as the airplane slowed down, but aware that the terrain dropped off beyond the runway end, the pilot decided to apply full braking effort, rather than risk descending the drop-off. 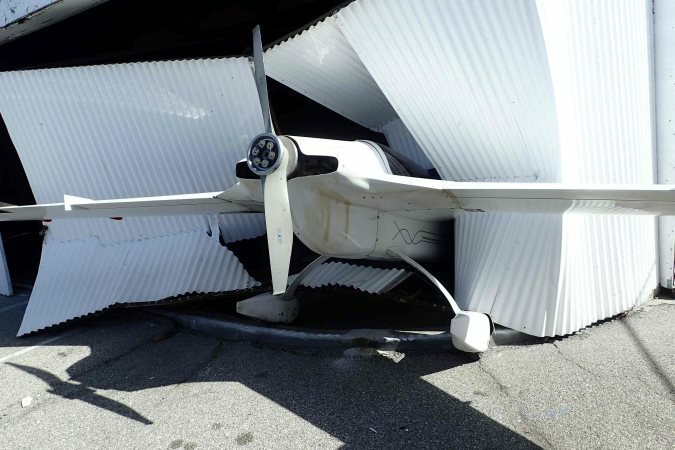 The airplane then veered violently to the left, crossed over the adjacent taxiway, and struck a hangar (Photo 1). Skid marks on the runway indicated that the airplane departed the runway surface just before taxiway B2, about 500 ft short of the runway end, and 1,300 ft before the end of the runway apron where the terrain dropped away. The skid mark on the left side was darker in color and more prominent than the mark on the right (Photo 2). The airport consisted of a single runway designated 3/21, which was shortened in December 2017 from 4,973 ft to 3,500 ft. The pilot stated that he was aware of the reduced runway length. Runway 21 slopes downhill, with a gradient of 1.2%. The airplane was equipped with a free-castering nosewheel, with ground steering accomplished through differential braking once rudder effectiveness diminished at lower speeds. The design did not incorporate conventional toe-brakes, but instead brake pressure was applied directly via the rudder pedals once they had been pushed beyond the pedals' rudder travel limits. Each rudder pedal was connected via cables to combination rudder and brake bellcrank assemblies mounted on the firewall. The brake master cylinders were also mounted on the firewall and connected directly to their respective rudder bellcrank assemblies. The master cylinders contained integral reservoirs; the cylinders were the 10-35 type manufactured by Parker Corporation. Accessing the master cylinders for fluid check and service required removal of the engine cowl. The main landing gear were equipped with conventional brake rotors and hydraulic calipers. Each wheel assembly was enclosed within a composite wheel pant, which visually obscured the caliper and brake rotor. Postaccident examination of the brake master cylinders revealed that the right brake reservoir fluid level was filled to just under half of its capacity. Further examination revealed that the top and rear surfaces of the right caliper were coated with dirt-encrusted fluid, from a leak which appeared to have developed at the inlet fitting of the caliper (Photo 3). 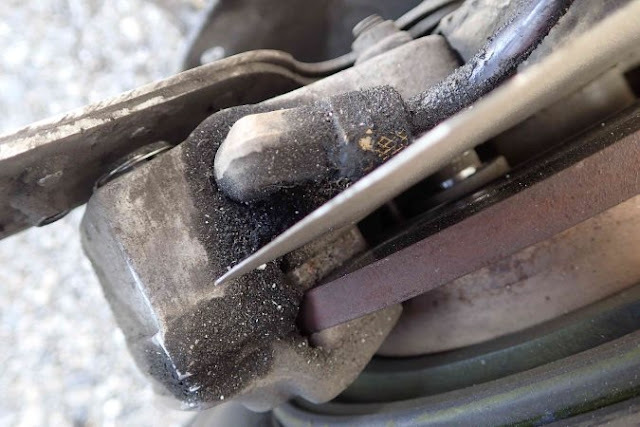 No active drips were observed, and examination of the remaining brake system components did not reveal any other fluid leaks or mechanical anomalies, and the left brake reservoir was full. Maintenance records indicated that the pilot replaced the hydraulic brake lines on the right side in July 2014, 147.3 flight hours before the accident. He reported using "NylaFlow" nylon tubing, in accordance with the airframe kit manufacturers instructions, and although there was no entry in the logbooks, he also replaced the left brake lines a brief time later with the same material. 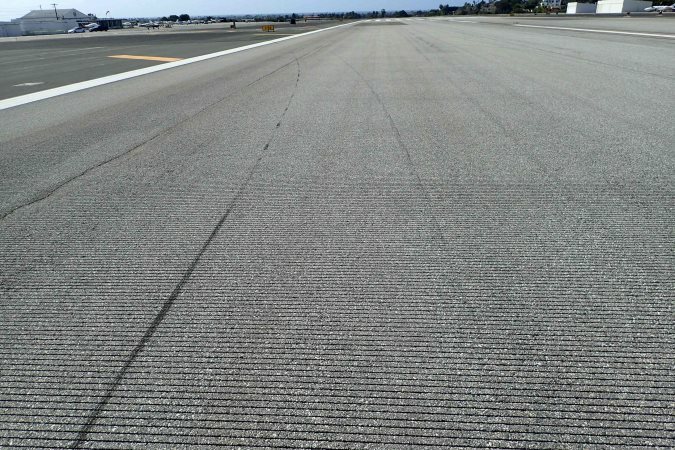 He stated that the right line was replaced because a leak had developed at the fitting on the caliper, such that he found fluid on the ramp during a preflight inspection. The pilot stated that he last checked the brake fluid reservoir levels at the most recent oil change, which according to the maintenance records, was 50.5 flight hours prior to the accident. He reported that on the morning of the accident, he had departed from two airports and tested the brakes during taxi on both occasions; the brakes performed appropriately, and no anomalies were encountered.